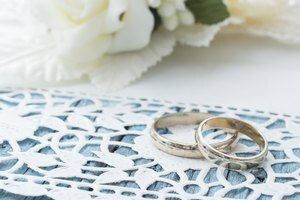 If you are looking for an inexpensive alternative to the traditional gold rings for weddings and special occasions, titanium might provide a solution. Similar in appearance to white gold, this sturdy metal can stand in for its more expensive cousin. Titanium is already in use by jewelers, so you should have no trouble finding styles that suit your needs. As with all things, titanium jewelry offers both advantages and disadvantages you should be aware of before you buy. Here's all the information you'll need to make the best decision for you. Titanium is an abundant metallic element that is used to make jewelry, golf clubs, watches and even aircraft. It was discovered in the late 18th century and was named after the Titans, mythical Greek giants who ruled the earth and personified different forces of nature. Titanium is one of the transitional elements on the periodic table of elements and is found in many forms. Titanium is lightweight, which makes the ring comfortable and easy to wear. It is a strong and resistant metal and much less expensive than other ring materials, such as gold or platinum, yet it is attractive enough for use as wedding jewelry. Titanium is hypoallergenic, so it is perfect for anyone with metal allergies. Unlike white gold, titanium can be left as is and will continue to look great over the years, instead of needing the occasional recoating that white gold needs. Also, titanium can be colored into a wide variety of colors. Titanium cannot be made into a ring with a prong setting, so it can't be used for a traditional-looking engagement ring unless the prong setting is made of a different metal and riveted onto the titanium. People can avoid this by having only the groom's wedding band made out of titanium and using a different material for the bride's set. Another disadvantage is that titanium rings can be difficult to fit. 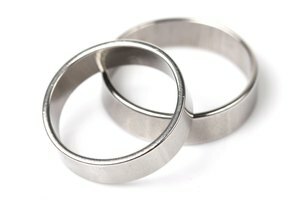 Titanium cannot be soldered, so if your ring is too large, it cannot be made smaller. If you need it made larger, the only option is to remove the material from the inner part of the band to make it slightly bigger. While titanium is surprisingly strong for how lightweight it is, it can still show signs of scratching and other wear. Titanium can usually be polished by a jeweler. If you want a colored titanium ring, consider that the color can wear and may need to be reapplied periodically. 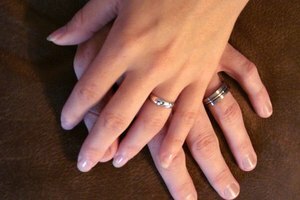 Whether a titanium ring is right for you depends on what you want. 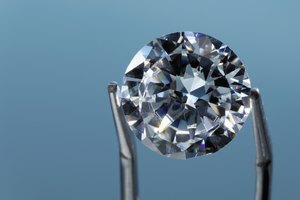 If you want a diamond engagement ring that matches the wedding band and that can be resized easily in the future, then a titanium ring is probably not right for you. However, if you're looking for a ring that is lightweight, attractive and relatively inexpensive, it may be just right.